LiveMind.com connects experts who want to teach with anyone who wants to learn in LIVE online classrooms. It provides teachers the platform and tools to bring their expertise beyond the typical physical boundaries of continuing education classes, enabling them to build their own online teaching business. It provides students the opportunity to learn anything in a live interactive classroom from the convenience of their computer. 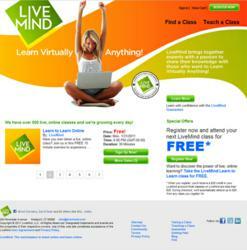 Just as eBay revolutionized garage sales, LiveMind will revolutionize live learning. LiveMind.com revolutionizes the adult continuing education and casual learning industry by putting teachers and students together in live, online interactive classrooms. Using the LiveMind platform and suite of services, anyone with expertise to share can create and teach a class on any subject, and offer it at any price. People interested in learning go to LiveMind.com to find and take classes on their topics of interest. They’re able to select classes and instructors based on class descriptions, instructor ratings and price. For teachers, LiveMind provides an easy-to-use, live teaching environment with the convenience, money making potential, and access to students that they could never get in their local geography. It is an easy-to-use, turnkey environment with all the tools necessary to allow a teacher to build an online teaching business. For students, LiveMind provides an easy-to-use, social learning experience with the convenience and breadth of topics they could never find in their local community. The online classroom experience has all the benefits of traditional teacher-led learning. It’s simple and fun to use.